Lower back pain can be quite debilitating, as tightness in the muscles can put pressure on the nerves leaving the spinal cord, which causes sharp shooting and referred pain. The most common cause is too much sitting, which some people spend most of their day doing. The discs in your back are designed to expand and contract as you move, which allows them to absorb blood and nutrients. When you sit, the discs are compressed and can lose flexibility over time. This can increase your risk of a bulging or herniated disc. Often I see patients coming in complaining of lower back pain, but in fact it is their upper glute muscles which are causing them pain. Pain which spreads through the hips and around the sacrum is often caused by tension through the hip muscles. These muscles are also involved in maintaining your posture. I see great improvements in back pain patients when I needle special points through the gluteal muscles to release the tension. All the muscles of our body attach to bones which give us structure. When the muscles though are overworked or damaged, the structure then starts taking the load. Prolonged wear and tear on the spine can result in slipped discs, or narrowing of the nerve channels called stenosis. This can lead to serious injuries and pain if left untreated. Once damage has been done to the structure then we have a serious problem. Do realise that spinal surgery is not a long term solution and should only ever be a last resort. What many people don’t realise is that once a vertebrae has been fused or operated on, it then simply transfers the load to the next in line and the problem continues. All other alternatives should be exhausted before you consider surgery on your spine! The inflammation in the soft tissue can transfer and cause the vertebral discs to become swollen, which then begin to press on nerves causing pain and even Sciatica. 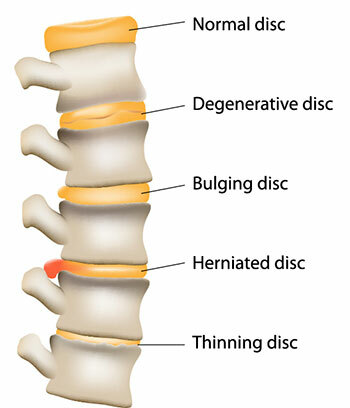 As shown in the adjacent diagram, there are several stages to disc degeneration. The sooner you act and seek treatment the better the outcome! As stated above, I treat back pain on a daily basis. No matter how long you’ve had the pain for, Acupuncture may potentially provide some long term pain relief. It all depends on the severity. If it is mostly soft tissue, just being tight muscles, then the prognosis can be very good. Often lower back pain is caused by cold and damp in Chinese Medicine, which are pathogens that block and lock up muscle. Often the pain is worse in the morning, and improves the more you move. As the circulating Qi helps move the cold and damp temporarily. If though we have herniated discs and stenosis, then its about long term management. The body is still capable of healing itself, but it cannot reverse all the structural changes which have occurred. The priority here is long term management to prevent further deterioration! Like with a vehicle that has damage, it can still go on, but you just have to change the way you do things. Bulging discs are not a life sentence, you can still have a long and active life, but you need to be aware of what you can and can’t do. Scientific research provided by the Acupuncture Evidence Report, found that Acupuncture had a medium/high standard of evidence for chronic lower back pain. This means that research has shown that Acupuncture may be able to help manage the pain associated with chronic lower back issues. Obviously everyone’s case is unique, and its best to call the clinic on 9796 2388 so we can discuss it further. Combined with Acupuncture I often show stretching and other exercises to help relieve lower back tension. It is my experience that few problems occur in isolation. Often there is muscle restriction and other issues in the surrounding joints and tissue which often contributes to the patients main complaint. If you are experiencing acute or chronic back pain seek treatment – Complacency is dangerous, if the pain isn’t improving on its own within a few days, then you should seek medical aid.